Located in the Caucasus region, straddling both Asia and Europe, Armenia is the perfect destination in which to journey through history, culture, and religion as it has one of the richest and longest histories of all countries in the region. Bordered by Turkey, Iran, Georgia and Azerbaijan, Armenia is a mountainous country and much of it sits at altitudes of around 1800 metres above sea level. A tour of Armenia is the perfect way to realise the fascinating, complex and significant history of the country. Not only was it the first country in the world to adopt Christianity as the state religion, shortly following Jesus’ death, it is also a former Soviet state, with many attractions and sights to spark the curiosity of all who visit it. Ancient religious sites such as monasteries, churches and even a Greco-Roman temple help to encourage tourism to the country, many of which are located in spectacular natural scenery. Once a great empire in the region, Armenia has spent much of its history under Ottoman and Byzantine rule. The Armenian Genocide of 1915-17 is a dark memory for all Armenians, a large proportion of which now live in the diaspora around the world. Today the population is up to 99% Armenian, ensuring a strong, proud cultural identity and a very family-orientated population who are known as being extremely hospitable people who will happily welcome visitors into their homes. English is not widely spoken, particularly outside of the capital of Yerevan, with Armenian and Russia being the main languages of the country. A package trip to Armenia is not complete without contemplating the natural beauty of the region. The beautiful mountain ranges, the highest of which is Mount Aragats, are characteristic of the country and glistening Lake Sevan is a popular holiday destination for lovers of water sports and hiking. If you are lucky enough to enjoy a holiday in Armenia you will be met with a strong nation, proud of its culture, bursting with untouched landscapes and ancient traditions. 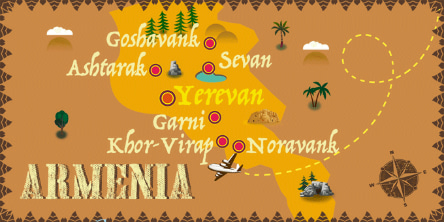 If Armenia has caught your attention, leave us your number so we can call you to discuss the voyage that awaits you.